G3YNH info: Components and Materials: Part 5. 2. Components and Materials: Part 5. 2-17. A realistic capacitor model. 2-19. Dielectric Absorption. 2-20. Ferroelectricity. 2-22. Electric and Magnetic Counterparts. (where C is in Farads and V, the voltage at the terminals, is in Volts). If the dielectric is a vacuum, the energy stored is simply the potential energy due to the physical attraction between the two oppositely charged plates. If a material dielectric is inserted between the plates however, the capacitance usually increases; which means that there is an increase in the amount of energy which must be delivered to the capacitor in order to achieve a particular terminal voltage. The only possible conclusion is that at least one new energy storage mechanism has come into play; and in fact there are various mechanisms, which make differing contributions to the capacitance depending on the nature of the dielectric material and the frequency of the applied field . The two fundamental energy storage mechanisms are known as 'electronic polarisation' and 'atomic (or distortion) polarisation'. When a dielectric is subjected to an electric field, an electronic re-distribution occurs within the atoms or molecules which make up the material; the more loosely bound electrons being slightly displaced from their normal orbits to favour regions where they are least shielded from the positively charged electrode (to which the are attracted). This is electronic polarisation. The positively charged core regions (nuclei) of the atoms meanwhile are displaced slightly towards the negatively charged electrode, and this effect is known as atomic polarisation. In molecules, since the degree of displacement is dependent on the electronic environments of the individual atoms, the effect of atomic polarisation is to stretch, compress, or bend chemical bonds. In ionic crystals (materials composed of positively and negatively charged ions, such as rock salt Na+ Cl-), the effect (also known as ionic polarisation) is to shift the average positions of the atoms and so distort the crystal structure. The result, in any case, is a stress in the material which is released upon removal of the electric field, i.e., the polarisation energy is given back when the capacitor is discharged. The electronic and atomic polarisation processes are almost perfectly elastic at radio frequencies; i.e., there is very little (but not zero) energy loss as the stored energy is released and the material is allowed to return to normal; which means that these processes make a significant contribution to the capacitance of a capacitor, but only a small contribution to the loss resistance. Both of these polarisation processes are also effectively independent of temperature at radio frequencies. By re-distributing the electrons, the effect of an electric field is to make an atom or molecule appear slightly positive when viewed from some directions, and slightly negative when viewed from other directions. In this condition, it is said to possess an induced dipole-moment. Many molecules however possess a permanent dipole-moment, this being due to a naturally non-uniform distribution of electrons within the molecule, and are said to be polar. In the absence of a field, polar molecules are either randomly orientated, or if packed into crystals, are usually stacked in such a way that the overall dipole moment is zero. When subjected to an electric field however, they show a tendency to rotate so that the most negative end of the molecule points towards the positive plate and vice versa. This is orientation polarisation. The process is illustrated below, where the symbol δ+ represents a slight deficit of electron density, and δ- represents a slight excess of electron density (the deltas in this case are just a standard notation meaning "a small amount of"; and have nothing to do with the loss angle δ). In general, an excess of electron density occurs in the vicinity of an electronegative (i.e., electron-hogging) atom such as oxygen, nitrogen, fluorine, or chlorine. The orientation process may involve overall rotation of the molecule about its centre of mass; or, especially in long flexible molecules such as those which occur in plastics, it may involve internal rotation. The diagram on the right (above) illustrates the latter process as it might occur in a polymer molecule with an occasional chlorine atom attached to the carbon-chain backbone. In this case the chain swivels about several carbon-carbon bonds in order to allow the electronegative chlorine atom to move towards the positive electrode. This is arguably an atomic polarisation mechanism, because it involves the stressing of chemical bonds; but it also corresponds to a localised orientation within the molecule. Here we will regard internal rotation in large molecules as an orientation process, because it gives rise to a frequency and temperature dependence of the dielectric constant which is similar to that associated with overall rotation. Note however, that if every possible substitution site in the molecule is occupied by the same type of electronegative atom, then the molecule will not be polar overall; which means, for example, that internal rotation polarisation will occur in partially chlorinated plastics such as PVC (polyvinyl chloride), but it will not occur in fully fluorinated plastics such as PTFE (polytetrafluoroethylene, CF3-CF2-CF2-CF2- . . . . . -CF3). Although polar molecules show a tendency to become aligned with the incident electric field, near-complete alignment does not occur except in the presence of extremely strong fields. One reason for this incomplete polarisation is that the orientating effect of the field is in competition with the randomising effect of thermal motions. It follows, that if the energy put into orientation is dissipated as a result of thermal randomisation, then the real part of the dielectric constant (that which represents real capacitance) is likely to reduce as the temperature is increased, and the imaginary part (that which represents losses) is likely to increase. Thus, in general, the dielectric constant of a polar material will be temperature dependent; although, as we shall see, the overall dependence is the sum of this and several other effects, and the actual temperature coefficient can be either positive or negative. Another factor which mitigates against the alignment of polar molecules in an electric field is the viscosity of the medium. In effect, a molecule may need to push other things out of the way in order to change its orientation, and it will take both time and the expenditure of some energy in order to do so. In general, the molecules in gases are free to rotate, the molecules in liquids are somewhat restricted, and the molecules in solids are highly restricted to a degree which depends on the internal structure of the material. The fact that it takes time to rearrange the medium means that there will be a frequency dependence of the dielectric constant, i.e., if the electric field changes too rapidly for the orientation process to make any headway, then orientation polarisation will be unable to make a contribution to the real part of the dielectric constant. Put another way, there will be a cutoff frequency, above which the capacitance of a capacitor with a polar dielectric will decline . This cutoff frequency incidentally, is likely to vary with temperature; since an increase in temperature usually involves expansion and a consequent reduction in the restrictions placed on internal motion. It follows also, that if a polar material is compressed, there will usually be a reduction in internal freedom; and so the dielectric constant may vary with pressure. In fact, all polarisation mechanisms have a cutoff frequency, which is related to a quantity known as the relaxation time for the process. The relaxation time is the time it takes for a displaced particle to return to the vicinity of its normal position after removal of the electric field, and is related to the reciprocal of the natural resonant frequency for the displacement. In effect, if an internal motion in the material is stimulated by a field varying at less than its resonant frequency, then the motion can track the changing field and energy can be stored in the spring-like forces which restore the particles involved to their normal positions when the field is removed. If the motion is stimulated at greater than its resonant frequency however, then it cannot keep up, and there will be no effective displacement and hence no capacitive energy storage. If the motion is stimulated at its resonant frequency, then its reactance will disappear (i.e., the motion will be in phase with the applied field), but its degree of excitation will be at a maximum; in which case it will be maximally efficient at absorbing energy from the field and donating it, through frictional losses, to the general thermal energy of the material. Thus, if the frequency of the applied field is increased, and should happen to sweep through the effective resonant frequency of some polarisation process, there will be a drop in the real part of the dielectric constant εr', and a corresponding peak in the dielectric losses in the region where the fall-off is occurring. Thus it transpires, that the real and imaginary parts of the dielectric constant cannot vary independently: they are, as was implied earlier, different aspects of a single physical phenomenon; and our identification of permittivity as a complex quantity is found to be fundamental. For those who wish to pursue the matter further, the relationship between ε' and ε" is described by equations known as the Kramers-Kronig relations . These relationships have profound implications for circuit theory because they arise from considerations of causality; for which reason they also imply constraints on the real and imaginary parts of any impedance function. Ultimately, every electrical and optical phenomenon can be understood in terms of the scattering of electromagnetic radiation by the arrays of oscillators of which matter is composed; and since scattered radiation cannot overtake incident radiation, there are natural restrictions on the relationship between resistance and reactance. The most obvious restriction is that impedance must always lie in the right-hand side of the complex number plane, i.e., resistance is positive; but a more subtle implication, which underpins the technique of circuit analysis, is that all impedances can ultimately be represented by networks of idealised positive resistances, capacitances, and inductances. The behaviour of the dielectric constant is illustrated below for a hypothetical material with only three resonance regions in its spectrum, all being somewhat more conveniently distinct than is usual. This is the general form however; and it allows us to make our first proper connection between electricity and general optics, by noting that the imaginary part of the dielectric constant, εr", represents the absorption spectrum of the material. In the diagram above, which represents an example dielectric rather than all dielectrics; the ability of the material to store energy as a result of orientation polarisation is shown to collapse as we sweep through the radio-frequency region of the spectrum. The corresponding peak in dielectric losses is shown to be broad because, in reality, particularly in solid and liquid materials, the resonances involved have low Q, and there will be a wide range of relaxation times due to the effect of the surrounding medium on the motions of the particles involved. There may also be several distinct steps in εr', due to the collapse of different orientation processes at different frequencies (e.g., internal as well as overall rotation); and correspondingly, several bumps in εr", all of which may overlap to some extent. If, on the other hand, the material is completely non-polar, there will be no capacitance due to orientation polarisation, and this situation is indicated by the dashed line corresponding to a value of εr' of about 2.5. What we see, in the idealised spectrum above, is that non-polar materials give a modest increase in capacitance when inserted between the plates of a capacitor (typically about 2 - 2½ times for solids), and the contribution remains almost constant until the frequency moves into the infrared region. Polar materials, on the other hand, give a much greater increase, but this may vary with frequency and temperature. What the diagram does not show, is that the range of frequencies over which an orientation process drops out of the dielectric constant, and the contribution to the capacitance below this range, may vary enormously depending on the material. In general, the drop-out range is in the microwave region for polar liquids, but may lie anywhere from millihertz to microwave for solid polar materials. The contribution to the capacitance due to orientation polarisation may also vary from a few percent to a factor of about 100, depending on the size of the dipole moment and the extent to which the orientation process can overcome thermal effects and environment. Thus there are many 'good' polar dielectrics, with a moderate contribution from orientation polarisation which is sustained over a very wide frequency range. In general however, the larger the contribution, the greater the losses when the useful frequency range comes to its end. The atomic polarisation process generally drops out of the dielectric constant in the infrared, and the corresponding peak in losses is the vibrational absorption spectrum of the material. This effect, being outside the electrical frequency range, must be measured using optical methods. In an infrared spectrometer, the absorption region of a molecular medium can be resolved into separate peaks for the various internal bond-stretching and bending processes. In crystals, the absorption region can be resolved into the various lattice vibration modes. Higher still in frequency: there is another absorption region associated with the collapse of the electronic polarisation process. This usually occurs in the ultraviolet, but some materials have absorptions which begin in the visible part of the spectrum. The dropping-out of electronic polarisation corresponds to the electronic spectrum of the material; and once again, this time with the aid of a UV-visible spectrometer, it may be resolved into separate peaks for the various electronic energy transitions which may take place. Should any part of the absorption spectrum of a material encroach upon the visible range, then the material will appear to be coloured. The human eye samples the relative intensities of light at three wavelengths, these being approximately 600, 540, and 450 nanometres. The corresponding frequencies are 5×1014Hz (red), 5.6×1014Hz (green), and 6.7&times1014Hz (blue). The eye perceives colour in transparent objects when one or two of these frequencies is attenuated relative to the ambient illumination. The slight greenish tinge of soda glass, for example, is due to the tail-end of the vibrational spectrum attenuating some of the red (low frequency) content in the transmitted light, and the run-up to the electronic spectrum absorbing some of the blue (high-frequency) content. It is no coincidence that James Clerk-Maxwell was also studying the visible spectrum and the human perception of colour at the time when he developed the electromagnetic theory. By showing that electricity is a form of light, he established a definite relationship between the refractive index in optics and the dielectric constant obtained from electrical measurements. We will not go into the details here; but it is necessary to mention the relationship in order explain the use of the term "dispersion" in the discussion of dielectrics. A glass prism (i.e., a block of optically transparent dielectric material) will split or "disperse" white light into its component colours. Dispersion occurs because the refractive index is different for different colours (i.e., different frequencies) of light. Refractive index is not synonymous with permittivity, but it is linked to it by simple mathematical function (in non-magnetic materials it is simply the square-root of εr); and so it is legitimate and also conventional to describe a region of the spectrum where the dielectric constant is changing as a dispersion region. All transparent dielectrics (except vacuum) have at least a weak dispersion region in the visible part of the spectrum, this being the precursor to the collapse of electronic polarisation which occurs in the ultraviolet. Polar solid and liquid dielectrics often have dispersion regions in the RF or microwave parts of the spectrum, this being due to the collapse of orientation polarisation. In formulating component models, it is important to bear in mind that resistance, capacitance, and inductance are not human inventions. They are manifestations of the basic laws of nature which join together in the electromagnetic theory; and the fact that we can make resistors, capacitors, and inductors, which very nearly isolate these three properties, tells us that nature has not tried very hard to prevent us from discovering the underlying rules. As we try to push our passive electronic components to work at ever higher frequencies however, we find that the simple descriptions break down; and ultimately we are forced to recognise all electrical phenomena as the interaction between fields and matter. The question which then arises is that of; "how do we translate the physics into a practical circuit theory?" The answer is no secret, and it has been stated in various ways in the preceding sections, but having taken a look at what goes on inside matter, we are in a position to state it in its most fundamental form. The pure component descriptions, which turn out to be too simple to describe real components, fail because there is a minimum unit of circuitry; this minimum being best described as a scattering element. One of the fundamental tenets of the electromagnetic theory is that charges lose energy (i.e., radiate) when they are accelerated. Deceleration, incidentally, is just negative acceleration, and so the term 'acceleration' should be taken to include it. Time-varying electromagnetic fields cause charged particles to accelerate, and so every particle affected by a field absorbs energy from the field and re-radiates it. This absorption and re-radiation process is known as scattering. The result is that radiation cannot pass through matter unhindered, and the resulting field is the sum or 'superposition' of all of the fields due to the incident and scattered radiation. Later on, we will see how scattering accounts for the apparent reduction in the speed of light which occurs when radiation travels in a dielectric material, but in the present context, we are interested in the fact that the charged particles are bound together into structures (atoms, molecules, crystals, etc.) which undergo natural oscillatory motion. This means that natural scattering elements contained within matter are resonators. In order to make the connection between basic physics and circuit theory, we need to recognise that scattering works on any scale; i.e., an assembly or collection of scattering elements is also a scattering element. The most graphic illustration of this point is given by the Yagi antenna, which can be understood as a giant form of dielectric. In this case, there is usually one driven element or wave launcher, and a collection of scattering elements which absorb energy from the incident field and re-radiate it. The principal difference between this and a microscopic scattering array is that we can alter the resonant frequencies of the elements by altering their lengths, thereby tailoring the phase relationships between the incident and scattered waves so that we may achieve addition in a particular direction, and a reasonable degree of cancellation in all other directions. This is just an obvious example of scattering however, because the concept of scattering provides us with the only reasonable way in which we can explain how the device works. Ultimately we must recognise that all electrical circuits are arrays of scattering elements which, by appropriate choice of phase relationships, allow us to direct energy from one place to another. This allows us better to understand that energy is not confined by the circuit, but merely guided by it; and while this might seem like an alarming extension to simple circuit theory, it will not lead us into any great theoretical difficulty. It is just a reiteration of a point made earlier, which is that there are constraints on the impedance versus frequency characteristics of any physically realisable device. The overall constraint is: that if a proposed device doesn't either scatter or completely absorb radiation, it can't be made (the only possible non-scattering non-absorbing 'device' is a vacuum). We can therefore deduce that the minimum circuit element must have at least one resonant frequency, and it will in general have some losses; which means that it can only be modelled by a network containing at least one pure resistance, one pure capacitance, and one pure inductance. We knew that already of course, but what is less obvious is that we can chop the circuit down into smaller pieces, and the same basic rules will continue to apply. This means that the impedance-related consequences of scattering on a microscopic scale can still be modelled by idealised LCR networks. In the previous section we showed how the real and imaginary parts of the dielectric constant vary with frequency, and explained this behaviour in purely physical terms. Now however, we may presume that all of the polarisation processes can be represented by LCR networks, or combinations thereof; and so we may deduce an equivalent circuit which, as it will turn out, behaves in almost exactly the same way as a practical capacitor (see below). The resulting model is still not completely general for two reasons: firstly, it neglects non-linear effects, e.g., it ignores the fact that components can be destroyed by exceeding their power or voltage ratings; and secondly, it assumes that there is no time difference between events occurring in different parts of the component, i.e., it does not include transmission line effects. It is however, good enough to model physically small components (less than 0.1λ in any dimension); and it will suffice for its purpose, which is to show how the processes occurring within the capacitor contribute to its impedance. The elements on the left hand side of the diagram, LS, Rts, and C0, are of course the impedance contribution due to the circuitry and the capacitor plates. This contribution is not properly modelled, because LS and Rts vary with frequency and so are not pure. We will set this limitation aside however, because we are primarily interested in the properties of the dielectric, which are divided into conduction and polarisation processes. Several conduction processes are shown, because several conduction processes are possible. Ordinary conduction involves electrons, but it is also possible for a current to be carried by ions (i.e., atoms or molecules with one or more missing or additional electrons), and in semiconducting materials, by holes. Different current carriers have different mobilities; and limited mobility has the effect of reducing the conductivity due to a particular carrier as the frequency is increased. This effect is modelled by a series inductance; which causes the impedance of a particular conduction process to rise with frequency, and its contribution to the capacitor impedance to fall. This inductance, of course, represents the magnetic field due to the conduction process. The mandatory capacitance associated with conduction is provided by C0, i.e., it is associated with the electric field which drives the process. In the previous section, we stated that polarisation gives rise to a behaviour of the dielectric constant whereby a drop in capacitance is always associated with a peak in dielectric losses. This behaviour is perfectly modelled by a series LCR network in parallel with a capacitance. The properties of an LCR network are always that, at low frequencies, the capacitive reactance dominates to the extent that the resistive and inductive contributions are negligible, and the network is to all intents and purposes a pure capacitor. As the resonant frequency is approached however, the impedance of the network falls as the inductive reactance starts to cancel the capacitive reactance. This causes the current to rise for a given applied voltage; and hence causes the power dissipated in the loss resistance to increase, reaching a peak at the effective resonant frequency. Above the resonant frequency, the impedance of the network increases again as inductive reactance takes over, and the power dissipated in the loss resistance declines. In modelling terms, the low frequency contribution to εr' is set by choosing the capacitance value Cpn (for polarisation process n), the peak contribution to εr" is set by choosing the resistance Rpn, and the resonant frequency is set by choosing the inductance Lpn. We will demonstrate all of this in the next section; by converting the model into an expression for the dielectric constant, and then plotting it as a set of graphs. In the capacitor model given above, the elements representing conduction and polarisation constitute an equivalent circuit for the dielectric. What they really represent however, is a mathematical function describing the frequency dependence of the dielectric constant. Here we will explore this function for the case of a simplified version of the model; which has no conduction processes (infinite resistivity), and only one polarisation resonance in the frequency range of interest. This model, despite the simplification, can give a perfectly adequate description of a dielectric which is a good insulator, and which has a polarisation process with a reasonably narrow range of relaxation times. It therefore applies to a surprisingly large variety of capacitive devices provided that the frequency range chosen is not too wide. The technique required for the analysis however, is perfectly general; and can easily be extended to cover an arbitrarily wide frequency range because it resolves the dielectric constant into a series of additive terms. In the simplified model (right), C0 is, as usual, the capacitance of the capacitor without a dielectric, and the series LCR network represents the polarisation process to be simulated. Other polarisation processes (e.g., atomic and electronic) are assumed to have dispersion regions at frequencies well above the range of interest, and so (as we will demonstrate) can be represented by a single capacitance C∞. (where " // " means "in parallel with"). We could, of course, simply add C0 to C∞ and treat them as a single capacitor; but we will not do so because, by keeping them separate we will end up with an arithmetic series for εr in which the first term is 1 (an arithmetic series is an equation in the form A = A0 + A1 + A2 + A3 + ...... + An, where A is an arbitrarily chosen symbol). The first term will therefore represent the capacitance in the absence of a dielectric (εr=1 for vacuum), and all of the other terms will then be associated with the dielectric only. and the obvious approach would be to put both sides into the form 'a+jb' and equate the real and imaginary parts. It does not take much investigation however, to verify that if the problem is attacked in that way the algebra will soon become very messy. We will therefore redefine the problem in terms of admittances (i.e., reciprocal impedances. See [AC Theory, 44] ). Although we will explore it as it stands, note that this representation for the dielectric constant can easily be extended to cover an arbitrary number or polarisation processes having dispersion regions in the frequency range of interest. All that happens when another series-LCR network is added to the model; is that another additive term, identical in form to the middle term in the expression above, appears in the equation. For this simplified example we have not bothered to number the polarisation parameters, but assuming that we replace Lp, Cp, and Rp with Lpn Cpn, and Rpn (where n=1, 2, 3, ... etc. ), and use a different n for each term, we can go on adding terms and adjusting the parameters to model dielectric behaviour of any complexity. We can even model conduction processes by adding terms in which XCpn has been set to zero. The only thing we cannot do is set C0 to zero, since that would make |XC0| and hence |εr| infinitely large; but setting C0 to zero is physically impossible because it leaves us with no mechanism for applying an electric field to the dielectric. This incidentally, is not a failure of the model, it is simply a limiting condition: it tells us that when the impedance of the capacitor becomes infinite, then Tanδ=εr"/εr' tends towards ∞/∞, which means that the loss angle is can take on any value between the limits 0° and 90° (i.e., the device is still notionally a capacitor, but we can't say what the loss angle is). Notice in these expressions, that at low frequencies, the quantity XCp² will become very large and so will dominate the denominator of the polarisation term. The result will be that εr" will tend towards zero; and the middle term in the expression for εr' will tend towards XC0XCp/XCp²=XC0/XCp. Since XC0=-1/2πfC0 and XCp=-1/2πfCp, then XC0/XCp=Cp/C0. This tells us that the assumption that all polarisation processes which resonate above the range of interest can be represented by a term C∞/C0 is perfectly valid, because all polarisation terms take on this form when the frequency is well below the resonant frequency. What we find is that when Qp is substantially less than 1, the model produces classic orientation polarisation behaviour. The only point to note about this is that the peak in εr" is skewed to the low-frequency side of fp, and those who care to experiment with the model will discover that, while the overall appearance of the graph remains unchanged, the peak moves to lower frequency as Qp is reduced. This Q-dependent movability of the dispersion region is one possible source of temperature variability of the dielectric constant (although temperature variation must also be expected to alter the relaxation frequency and the L/C ratio, giving rise to a range of possible behaviours). The model is therefore successful, and is capable of describing a wide variety of ordinary polar dielectrics; but what is interesting is the behaviour it exhibits when Qp is allowed to become greater than 1. One of the intriguing properties of the series LCR model for a polarisation process is that it predicts effects which we might not have expected, but which actually occur. If the Q of the network is high enough, there will be a region just above the resonant frequency where the network places a very low inductive reactance in parallel with C0. This can have the effect of making εr' less than 1, or even negative, provided that the inductance can overcome the capacitance due to other polarisation processes. This effect does not show up at radio frequencies in normal dielectrics, because the polarisation drop-out regions are very broad; but it can be seen very clearly at optical frequencies as a refractive index of less than unity on the high-frequency side of sharp vibrational and electronic resonances. Thus a humble engineer's model intended to describe radio components predicts bizarre optical effects which really exist; which hopefully underlines the point that the association we have made between circuit theory and polarisation is genuine. The model goes even further however, because when the Q is allowed to become very high, it describes the mechanical resonances which occur in piezoelectric materials (which will be discussed in a later section). Thus all of the behaviours predicted by the model turn out to have natural counterparts, which leads us to an interesting philosophical point: The test of any theory lies not in its descriptive power, but in its predictive power; and the theory in this case is that the world of matter is composed of resonant scattering objects. which gives us two very important pieces of information: firstly, the frequency at which (XLp+XCp) goes to zero is unchanged, and so the resonant frequency of a large number of identical series resonators connected in parallel is the same as that of the individual resonators; and secondly, the ratio of reactance to resistance of the individual resonators is the same as the ratio for the array of resonators (i.e.,Xp/Rp=[Xp/n]/[Rp/n], because the n's cancel). This means that the Q of the resonance is the same regardless of how many resonators are connected in parallel (provided that those resonators do not interact). Consequently (since the Q of a resonance dictates its bandwidth); connecting a number of identical non-interacting series-resonators in parallel can only change the magnitude of the resonance behaviour, it cannot change the bandwidth of the resonance. This brings us to the point, that the measurement of quantities relating to the dielectric constant can be worked back to obtain resonance parameters for the individual scattering elements in the dielectric. This is the basis of the various techniques of atomic and molecular spectroscopy (which are our principal source of information on the microscopic universe); where at radio frequencies the relevant measurements are the frequency dependencies of εr' and εr", and at optical frequencies the relevant measurements are the frequency dependencies of the refractive index and the optical absorption coefficient (i.e., the amount by which light of a particular frequency is attenuated on passing through a substance). There are considerably complexities involved in obtaining atomic and molecular data from spectroscopic measurements, and readers will need to delve deeply into the subjects of chemistry and physics if they wish to appreciate all of the issues. Here however, we can at least come to an understanding of what electricity is, and explain why a realistic model for a dielectric requires a startlingly large amount of inductance. What has just been stated is: that we can represent a polarisation process as an LCR network, and if we can work out how many units undergoing that process are contained within a sample of material, then we can work out an LCR network for the individual units. The units in question are often atoms or molecules, but there are exceptions: In the case of a material such as PVC, for example, we may be interested not in the number of molecules present, but in the number of carbon-chlorine bonds. In the case of a crystal, we may need to consider something called the "unit cell", which is the smallest group of atoms which can be regarded as a complete crystal, the crystal itself being a stack or array of these cells. The unit cell may contain several molecules, or it may be a collection of ions, and it may be difficult to decide whether or not multiple processes can occur within the cell. Crystals also have a habit of behaving as giant molecules, and so there are polarisation processes such as piezoelectricity, which involve the crystal as a whole. The list of exceptions could go on and on, but the point is in the principle: which is that we can notionally divide matter down until we reach a single unit which, if we divide it further, will suddenly cease to exhibit the behaviour we are studying. That unit will always be a collection of charged particles, and its behaviour in response to an electric field is as though a number of LCR networks, at least one for each resonance, has been placed across the plates of a capacitor. There is then nothing left to choose between the oscillating electric and magnetic fields associated with the equivalent circuit, and the oscillating electric and magnetic fields associated with the charged particles as they vibrate or rotate. The large inductance is therefore associated with charged particles in motion, which, of course, constitute an electrical current even if all the particles do is move backwards and forwards. The capacitance, as we already know, is associated with the displacement of charges from their equilibrium positions, and the resistance is associated with the leakage of energy away from the process which is being stimulated. Thus we have the complete connection between electrical (and optical) phenomena and mechanical processes involving charged particles. In any mechanical system, the total extractable energy is the sum of the potential energy and the kinetic energy at any instant (kinetic energy is the energy due to motion). When a system oscillates, kinetic energy is at its maximum when the particles are moving fastest (as they pass through and overshoot their equilibrium positions), and potential energy is at its maximum when the particles come to a momentary standstill at maximum displacement (think of a weight on a spring). If such a system is represented by an electrical network; the instantaneous potential energy term is the energy stored in the capacitance: Epotential=CVC²/2, and the instantaneous kinetic energy is the energy stored in the inductance Ekinetic=LIL²/2. In any system involving alternating electric and magnetic fields, there must be constant trading between potential and kinetic energy, and so inductance and capacitance are inseparable on a fundamental level. This is, of course, why we cannot represent a dielectric correctly without including inductance, and we cannot create a circuit which does not include both inductance and capacitance. Before we move on to the more practical aspects of the polarisation theory, it is perhaps appropriate to offer some kind of conclusion to the discussion so far; and the point is this: people routinely use component models which omit either inductance or capacitance, and then presume that the resulting simulations imply realistic behaviour. The problem is that such models violate the Kramers-Krönig relations and thereby violate the principle of causality. This does not mean that models which fail to reproduce the system resonances are no good, far from it; but they are only applicable to narrow frequency ranges, and it is important to be aware of their limitations. An article on the subject of dielectrics cannot be complete without some mention of dielectric absorption. This is the propensity of certain types of capacitor to recharge spontaneously after having been discharged briefly and then left open-circuit. The necessary condition for dielectric absorption to occur is that the capacitor should have been maintained in a charged condition for a 'long' period prior to discharging. The best demonstration of dielectric absorption is given by ordinary aluminium electrolytic capacitors, i.e., capacitors in which the dielectric is a thin layer of aluminium oxide (Al2O3) formed on the surface of an aluminium foil. If such a capacitor is charged via resistor from a DC supply, the current will initially fall exponentially according to ideal capacitor behaviour, but there will remain a small residual current which dwindles extremely slowly over a period of several tens of minutes. If the capacitor is allowed to charge for half-an-hour or so, then removed from the supply and discharged rapidly through a low-value resistor, the terminal voltage will typically rise to about 5% of the original charge voltage after the discharging resistor has been removed. Dielectric absorption is primarily a hazard for those who work with high-voltage power supplies, and necessitates the use of bleed resistors to ensure that the equipment is safe after it has been switched off. It can also be troublesome in accurate measuring circuits involving capacitors, such as sample-and-hold amplifiers. In general, vacuum and gas capacitors can be assumed to be free from the effect, but all solid-dielectric capacitors must be assumed to exhibit it to some extent until proven innocent. Polystyrene, for example, a nominally non-polar dielectric with εr'=2.6, shows a voltage recovery of about 0.05%; whereas polyethylene-terephthalate (PET or Mylar), a slightly polar dielectric with εr' of about 3, shows a voltage recovery of about 0.25% . Imagine a material as a compressed collection of irregularly shaped granules, with diffuse patches of resistive material trapped in the cracks between them. If the material is made into a capacitor and charged; there will be an initial polarisation due to the overall electric field between the plates but, by leakage of charges through cracks and pores, it will be possible for isolated pockets of dielectric to be subjected to electric fields stronger than the average. In effect, resistive inclusions will shunt parts of the dielectric, reducing the effective plate-spacing and thereby increasing the capacitance if the charging period is long enough. Thus it will appear that there is an additional capacitance, with a large series resistance, in parallel with the main capacitance. It is in this additional capacitance that the dielectric absorption charge is stored, and it will leak back into the main capacitance if the capacitor is briefly discharged and then left open-circuit. This effect is indistinguishable from slow orientation polarisation, except that it also occurs in non-polar materials. In some materials, there is a giant polarisation effect called ferroelectricity, which can give rise to an εr' of up to 15000. Ferroelectricity is a property of crystals which have a permanent dipole moment in the unit cell, and in which the conditions are such that the dipole moment can flip to a new orientation with minimal rearrangement of the atoms . Extreme alignment with the field is possible, hence the large εr', but it is also possible to saturate the alignment process, i.e., to align all of the dipoles which can be aligned; the result being that the capacitance of a capacitor with such a dielectric will diminish as the field-strength is increased (i.e., the polarisability will diminish as the number of dipoles available to be aligned is reduced). The ferroelectric effect is therefore non-linear, in addition to being temperature dependent. Ferroelectricity, being the property of extreme permittivity due to flipping of electric dipoles, is so called by analogy with its cousin ferromagnetism, which is the property of extreme permeability due to flipping of magnetic dipoles. Like ferromagnetic materials, ferroelectric materials have a Curie point, i.e., a temperature above (and sometimes below) which the effect disappears. Known ferroelectric materials include: titanates, particularly barium titanate, BaTiO3; tartarates (salts of tartaric acid) such as Rochelle salt; and potassium dihydrogen phosphate (KDP). The ferroelectricity of barium titanate is due to to the titanium ion Ti4+ having more room in the unit cell than it needs. This gives the ion six possible equilibrium positions with low energy barriers between them, each resulting in a different orientation of the dipole moment . The Curie point (115°C) is the temperature above which the ion has more energy than it needs to hop the barriers between between the energy minima, in which case it is no longer localised by the barriers and ferroelectricity disappears. The ferroelectricity of tartarates and KDP is due to the rearrangement of hydrogen bonds (weak inter-atomic bonds) under the influence of an electric field. Barium titanate is the principal ingredient of dielectrics used in ceramic capacitors; its large dielectric constant being of particular value in radio-frequency applications. Dielectrics with a high BaTiO3 content (known as 'high k' dielectrics) enable a large amount of capacitance to be obtained in a very small volume, this being highly advantageous in fast-switching and radio-frequency applications because small size permits minimisation of parasitic inductance. High k ceramic capacitors are therefore the preferred types for RF coupling and decoupling applications, where low inductance is more important than the actual capacitance value. One further important property of BaTiO3 however, is that it can be used to modify rather than dominate the characteristics of a ceramic, allowing the production of dielectrics with nearly-perfect RF properties. This is the basis of the so-called 'Class 1' ultra-stable ceramic capacitor, which combines low inductance with a very small Tanδ, minimal dielectric absorption, and a very low temperature coefficient, making it the ideal choice for critical applications such as filters and oscillators. Modern class 1 capacitors generally have RF characteristics which are better than those of polystyrene and traditional mica capacitors . It is a property of all dielectrics that, under the influence of a polarising force (i.e., an electric field), their physical dimensions change. This behaviour may be broken down into two classes, these being electrostriction and piezoelectricity. The difference between the two effects is that an electrostrictive material will either expand or contract under the influence of a field, regardless of the polarity of the field; whereas a piezoelectric material will alternate between expansion and contraction as the field alternates in polarity. In either case, an alternating field will launch acoustic waves (i.e., pressure waves) in the material. Normally these vibrations will be ultrasonic, but if the frequency is within the audio range, and the effect is large enough, there will be an associated sound. The electrical consequences of the two phenomena are however, somewhat different. Since the electrostrictive effect is dependent only on the magnitude of the field, an electrostrictive material can convert electrical energy into acoustic energy, but it cannot convert acoustic energy directly into electricity. From an electrical point of view therefore, electrostriction only gives rise to losses; and these losses depend on the mechanical resonances of the dielectric and the degree of acoustic coupling to the surrounding media. It might seem therefore, that electrostriction should give rise to a peak in εr" without a corresponding drop in εr', in which case the Kramers-Kronig relations will be violated. Causality however, must prevail; and so nature closes this loophole by ensuring that a dielectric can store more energy if it is allowed to change its dimensions than if it is prevented from doing so. A material therefore has a different dielectric constant depending on whether it is clamped or free. It is extremely difficult to clamp a material in such a way that it cannot expand or contract, but there is no need. By the same argument as was used in the general discussion of polarisation; a material is 'free' in respect of a particular mechanical resonance if it is stimulated at a frequency below that resonance, and it is 'clamped' if it is stimulated at a frequency above that resonance (i.e., it cannot change its dimensions if the field is changing too rapidly for it to follow). Thus there is a drop in εr' on passing through an electrostriction resonance, and the Kramers-Kronig relations are obeyed. While electrostriction is, in one sense, just another type of polarisation process, it belongs to a special class because it has implications regarding the linearity of capacitors. The point is that if the dielectric constant changes due to a change in dielectric dimensions under the influence of a field, then the capacitance of a capacitor will vary according to the voltage appearing across its terminals. Thus electrostriction is a source of signal distortion; but fortunately, in most dielectrics, the electrostriction effect is negligibly small, and the amount of distortion produced is only of interest to extreme audiophiles (capacitor distortion effects in sensibly designed audio amplifiers lie below the compact-disc noise floor, so you need specially evolved ears to hear them). A large electrostriction effect occurs however in ferroelectric materials; and such is the association, that ferroelectricity and electrostriction are sometimes taken to be synonymous. In this case, non-linearity due to electrostriction is not such an issue, because ferroelectrics are already non-linear on account of the saturation effect mentioned in the preceding section. Piezoelectricity (pressure electricity) is a property of crystals which lack a centre of symmetry in the unit cell; i.e., the unit cell is such that if it is rotated in any plane, it will not look the same again until it is returned to its original orientation. The effect of this asymmetry is that if the crystal is subjected to a stress, there will be a separation of the centres of mass for the positive and negative charges, and the crystal will develop an overall electric field. Piezoelectricity therefore differs from electrostriction in that it is a reciprocal effect, i.e., piezoelectric materials can convert electrical energy into acoustic energy and vice versa. Piezoelectricity is exhibited by naturally occurring minerals such as quartz and tourmaline, and by artificially grown crystals such as Rochelle salt, lead niobate, lithium sulphate, and ammonium dihidrogen phosphate (quartz crystals are nowadays also artificially grown). It can also be induced in ferroelectric materials which do not already exhibit it, by heating the material to a temperature above the Curie point and and allowing the material to cool while under the influence of a strong electric field (the required field strength is about 50KV/cm for BaTiO3). Materials so treated are known as poled ferroelectrics, and are used in a large variety of devices such as: ceramic transducers (microphones, sounders, seismographic sensors, sonar transducers, accelerometers, ultrasonic cleaning and welding equipment), resonators, filters, and spark generators (self-lighting gas appliances, flintless cigarette lighters). In addition to barium titanate, the other commonly used ferroelectrics are: lead metaniobate (PbNb2O6), and lead zirconate titanate (PZT) . When Piezoelectric devices are based on naturally piezoelectric materials such a quartz, they must generally be constructed using a slab of material cut from a single large crystal; and the properties obtained depend critically on the orientation of the applied electric field with respect to the orientation of the unit cell (which is by definition asymmetric) . When poled ferroelectrics are used however, the material can be polycrystalline (i.e., an aggregate of randomly orientated microcrystals), because the piezoelectric property is induced after fabrication. This means that the ceramic devices have ease of manufacture on their side, and have therefore largely taken over from natural piezoelectrics; except where extremely high Q is required . The main disadvantages of poled devices are: that they may lose their properties with time (the aligned dipoles eventually become randomised), albeit very slowly; and they can be denatured by accidental overheating (such as during soldering). Glass tube diam: 17mm. B7G base. It is at this point that we should deduce the equivalent circuits for devices exhibiting electrostrictive or piezoelectric effects. The problem of how to do so will not detain us for very long however, because we have already solved it. Piezoelectricity and electrostriction are polarisation effects and so, in the case of two-terminal devices, can be described according to our normal polarisation model as series LCR networks placed in parallel with a capacitor . The big difference between piezoelectrics and normal dielectrics is that Q of the polarisation resonances can be very high (as much as 106 for quartz), which gives rise to immense excursions for εr' in the resulting dispersion regions. We should also note that these resonances correspond to the various ways in which sound waves can travel in the material and arrive in phase back at the starting point; and are therefore associated with bulk properties of the material such as the physical dimensions, density, and stiffness (elastic modulus). It is also impossible to obtain only a single mechanical resonance: there will always be a series of overtone resonances of progressively diminishing Q associated with each fundamental resonance; and there may be numerous weak fundamental resonances due to the various ways in which acoustic waves can propagate in directions other than perpendicular to the electric field. An accurate model, of course, requires an LCR network for every one of these resonance modes. The various wanted and spurious resonances of a piezoelectric device can be investigated most easily (at radio frequencies) by connecting it to an antenna analyser (although careful tuning of the VFO is required, because such resonances can be very sharp) . Piezoelectricity and electrostriction, although often desirable, can also show up a spurious circuit effects; particularly in association with devices constructed around ceramics and solid minerals. Such effects include: anomalous dispersion behaviour linked to dielectric dimensions (and therefore not reproducible between different test-capacitor setups), microphony, and audible noise from dielectrics operating at audio and power-line frequencies. Note that although electrostrictive materials cannot convert acoustic energy directly into electrical energy, they can still exhibit microphony because pressure waves will modulate the dielectric constant, causing terminal-voltage variation in charged capacitors. Note also that, since electrostriction depends on field magnitude, there will be two expansions for every cycle of the applied field, causing electrostrictive materials to buzz at twice the excitation frequency. Electrostriction (a property of all ferroelectric materials) has a magnetic counterpart called magnetostriction, which is a property of all ferromagnetic materials, which is one of the reasons why mains transformers buzz at twice the power-line frequency . See also: Luminous Quartz Resonators. Note 1. An electret (permanently charged dielectric) is formed by melting a polar polymer and allowing it to cool under the influence of a strong electric field. 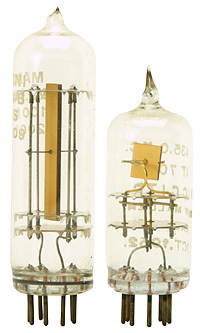 Electrets are used to make capacitor microphones (eliminating the need for a DC bias supply). Note 2. Piezomagnetism exists, but the term is not used. The effect is instead classified as a type of magnetostriction. When a capacitor is charged, a force of attraction exists between the plates. If a dielectric material is sandwiched between the plates, the plates will squeeze the material. That much should be obvious; and so we have another mechanical property of capacitors which can, in principle, give rise either to spurious or to exploitable effects. What is perhaps less obvious, is that a dielectric material, in increasing the capacitance, also increases the force. Indeed, it is not so much that the plates squeeze the dielectric, but that the dielectric squeezes itself. The stress due to this effect, which is distinct from electrostriction or piezoelectricity, is known as Maxwell stress. In most cases the strain (dimensional change) due to Maxwell stress is very small, and is subsumed by the much greater (but also usually negligible) strain due to electrostriction. In elastomers (rubbery materials) however; the dimensional change can be substantial if the field strength is large enough, and the force in the event that such change is resisted may be sufficient to cause mechanical problems. In general, an engineer should simpy be aware of Maxwell stress when proposing to subject elastomers (e.g., silicone and acrylic architectural fillers and sealants) to strong electric fields. In recent times however, there has been interest in the possibility of using dielectric elastomers to make artificial muscles (linear motors), both as a source of novel devices and as a potential replacement for many of the bulky magnetic motor devices in common use (e.g., loudspeakers and actuator solenoids). Crucial to the development electrostatic motors has been the development of elastic capacitor electrodes, the issue being that as a block of elastomer shrinks in length under the influence of a field, it also increases in area, and an electrode is needed which can expand in area accordingly in order to maintain a reasonably uniform field . The resulting length change and pulling force can then be substantial: approaching that of biological muscle , using drive voltages in the order of 1 to 5KV. Mechanical power output, of course, is represented (as always) by the power dissipated in a resistive component of the capacitor's impedance. We should also note, of course, that when an elastic capacitor is stretched or compressed, its capacitance will change. This is a possible source of electrical instability (microphony, oscillator drift etc. ), but can also be used as the basis for the design of pressure sensors. It must also be admitted at this point; that although capacitance change is not a basis for direct conversion of mechanical energy into electrical energy, electrical energy can nevertheless be extracted by the use of charge-pumping circuitry. This latter technique has, for example, been used to extract energy from elastic capacitors fitted in boot-heels, the act of walking having the potential to produce about 1 Watt of continuous power (sufficient to operate a piece of equipment such as a cellphone) .